I’ve given my ode to Fall a few times recently. And despite this being election week, I opted to not let that stress me out. I’m not about to get political, but I think we can all agree that we’re glad that it’s finally coming to an end, right? To distract myself from all things politics and focus on Fall, which I love, something with pumpkin sounded fun. 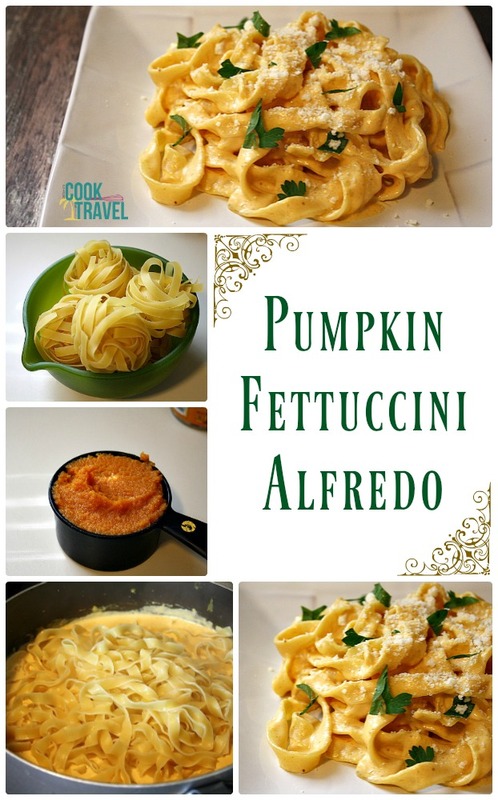 And Pumpkin Alfredo was too cool not to try! The temperatures are finally starting to cool down in the Midwest a tad. Now I am okay saying goodbye to the 70 and 80 degree days, but I still want Fall to stick around for a while. I prefer to not dive right into the freezing temps. Maybe Mother Nature will keep us in the 40’s or higher for a few months. After all, I have some cute jackets that would like to be worn for a couple of months before the winter coat comes out. Regardless of who you voted for, I think we can all agree that pumpkin is better than politics. I love cooking with pumpkin. It’s so fun to bake with! From Pumpkin Snickerdoodles to Paleo Pumpkin Bars to Pumpkin Waffles and Pumpkin Bread (and even more!) . . . well I’m a fan of ALL of them. And for some reason, cooking with pumpkin really fascinates me, and I haven’t cooked with it too much. The first savory thing I cooked with pumpkin was last year’s Pumpkin Ravioli. And that dish was seriously yummy. I was a bit nervous with this Pumpkin Alfredo that it would be really weird tasting. But it was damn good! Since I’m a busy girl, I really need to use my time efficiently. And if I can whip up a delicious meal in a few minutes, then I’m a happy girl. Pumpkin Alfredo comes together in a snap! Start off by boiling some water for your pasta. Then you’ll cook your fettuccini with according to your package instructions. This recipe comes from the site Pinch of Yum, which is jam packed with delicious food. And they recommended the little fettuccini nests, which is what I went with. I love it because they are more like egg noodles and really highlight a sauce well. For the sauce, you’ll heat some butter in a pan and then add the garlic until you can smell it. Then a cup of pumpkin and some heavy whipping cream is whisked in and simmers until it’s thickened a little. Now I apparently can’t read and only had 2 cups of cream instead of 2 1/2 cups, but the recipe still turned out perfectly, so you pick how much cream you want. At the end you’ll whisk in Parmesan cheese and season with salt and pepper. Add the cooked pasta to the sauce and toss until it’s coated. I served mine with a light dusting of grated Parm and some chopped parsley for color. I think the parsley not only makes it pretty, but the fresh herb helps balance the richness of the Alfredo. 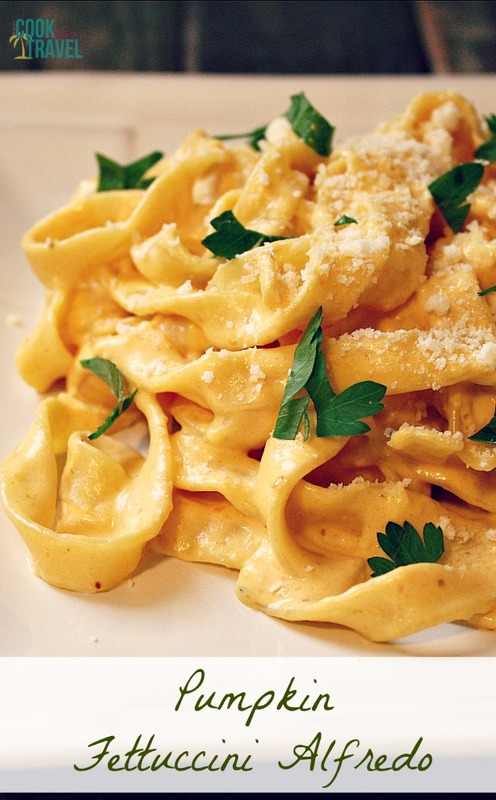 When it comes to flavor, the Pumpkin Alfredo tastes like a traditional Fettuccini Alfredo. You have a buttery undertone (and it only has 2 tablespoons in the whole dish), the garlic is in every bite, there is a very subtle sweetness from the pumpkin, and the Parmesan adds a nice salty bite. To me the pumpkin is a great addition add sweetness but also a really gorgeous color. 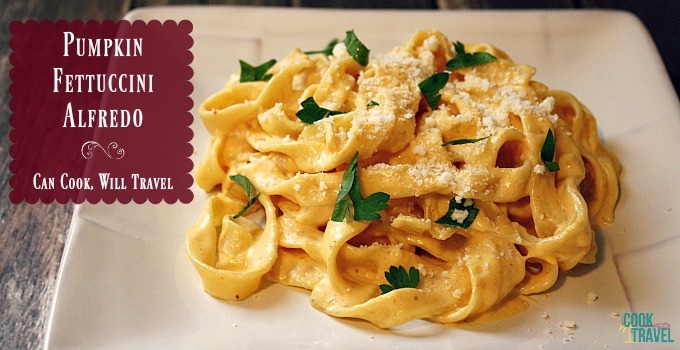 So next time you find yourself with some canned pumpkin and you have a cup or so of it, then you really do need to whip up this Pumpkin Alfredo for yourself! Click that link for the recipe and step by step instructions. I think you’ll be glad you did! Happy pasta eating! Two years ago: Chia Seed Blueberry Muffins = Healthy Comfort Food! Four years ago: Ka Pow! It’s Kung Pao Chicken! Five years ago: Monkey Bread!